Island hopping in the sunshine – whats not to like? 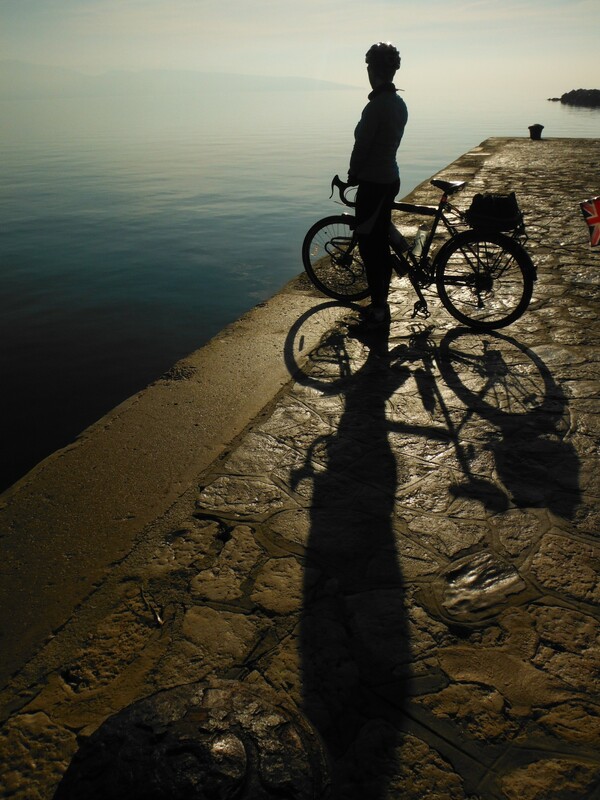 Well the sun shone as we rode downhill to the first Croatian ferry, but this wasn’t to last as we disembarked on Cres, island destination number one, under heavy cloud. 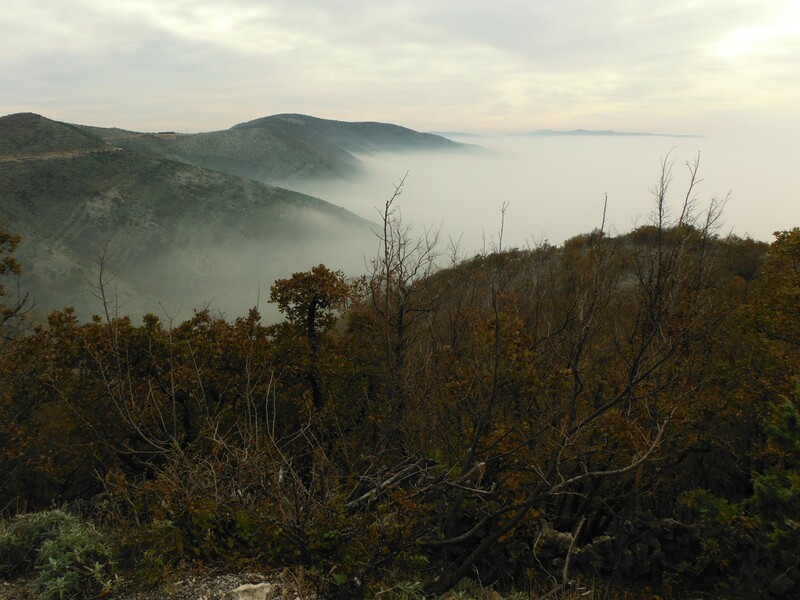 Cres is a sparsely populated and rocky mass with, unsurprisingly, many hills. Once the few other cars from the ferry had sped past us, we then had the small quiet road to ourselves for the morning, passing nothing but rocks and sheep. This reminded us of the Scottish Outer Hebrides, helped by the fog and mist, and was a world away from the busy coastal road we had been on previously. 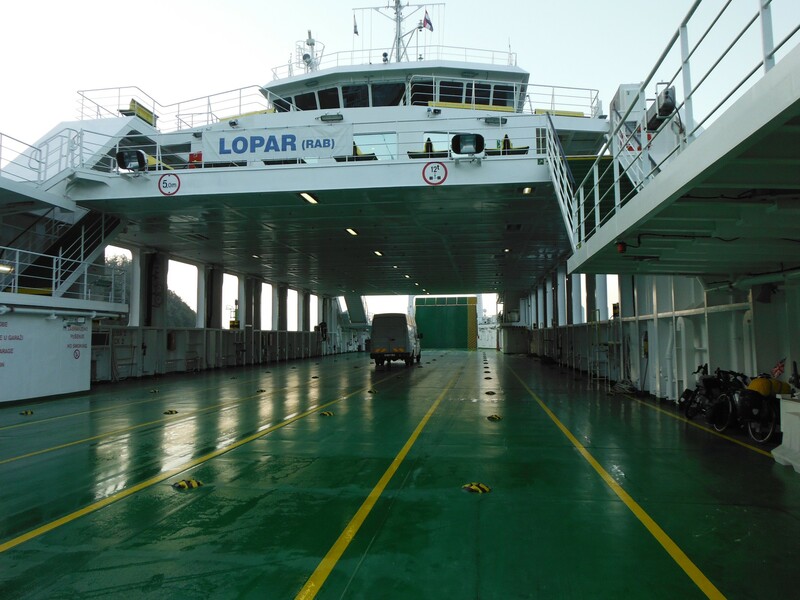 It really was desolate – the only civilisation we saw was when we got to the port at the other end to catch the next ferry (actually a surprisingly large number of vehicles – where had they all been?!) 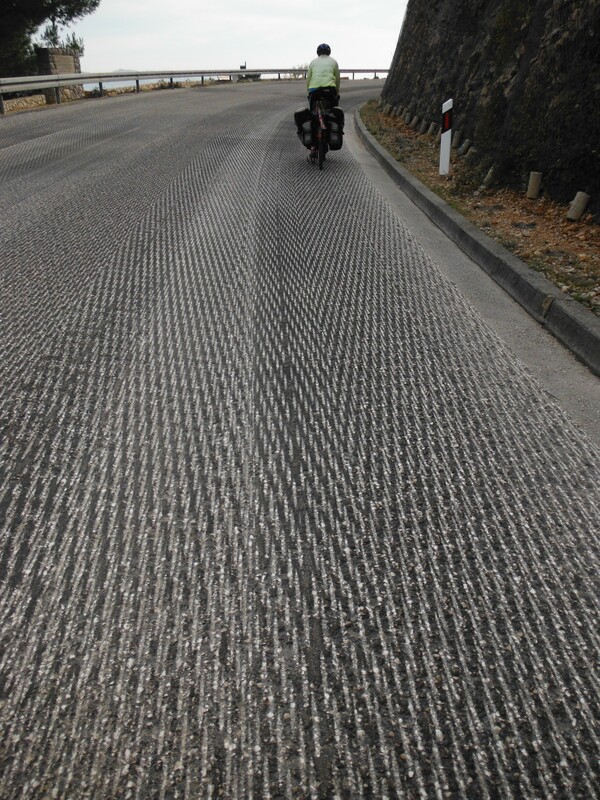 Anti-highlight of Cres was climbing to over 450m very slowly, then having the descent ruined by ‘road resurfacing’ which seemed to have involved a roller with spikes on driving down the new surface, creating a grooved pattern that when ridden over at any speed made our brains shake and eyes go crazy looking at its optical illusion effect. Krk, island number two, was likely to be busier as it is connected to the mainland by a bridge and has a few bigger resorts. But out of season it was as quiet as the others, and in Krk Town we found a very cute old town, with a few more people floating around. We had a lovely bargainous studio apartment, so decided to take a day off (despite it being on the top floor of the building and our need to have the bikes in the room where we sleep meaning lots of lugging the bikes up and down stairs). 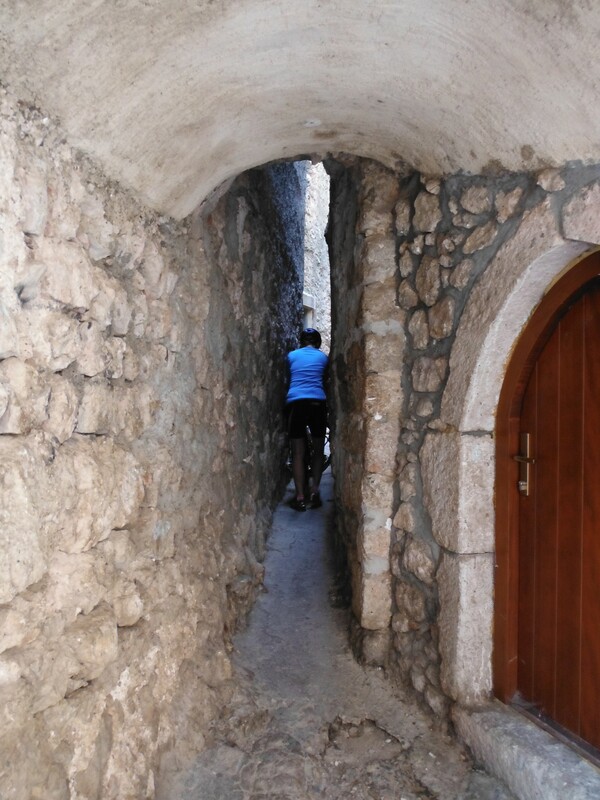 The next day we took a ‘recreational ride’ around the island – the kind of thing cycle tourists tend to do on a ‘day off’ – visiting Vrbnik, home of the worlds narrowest street which we just about squeezed our bikes and us through (luckily no panniers). The sun was shining again so we had lunch on a deserted beach with boarded up food and drink shacks, reminding ourselves of the benefits of off season travel as this beach is apparently packed in the summer. For us, nothing but the sound of the waves and our own company, until an old guy in a mobility scooter rode up and settled in right next to us. The following day, after a 6.15am start to catch the morning ferry to Rab, island number 3, we were joined on the huge ferry by one white van and a handful of foot passengers. We couldn’t see a thing from the ferry through the cloud so settled in with a cup of tea, second breakfast and The Apprentice (I know, we are adventurous). Rab is only 28km long so we didn’t plan to stay long, Rab Town was a charming if totally deserted third breakfast stop (essential after such an early start), and the cloud probably gave us a bad impression of the island but for 20 of the 28 kms the road was a seemingly endless string of rooms to rent. Whilst not built up, it definitely had less of an island feel to it, until we reached the bottom third and suddenly the houses stopped and it seemed like we had ridden onto the moon by mistake. The land became rocky and bare and the descent to the ferry through this strange scenery was ace. We rejoined the mainland coastal road for a short stretch, although the road is at one of its highest points here so we first had a killer climb up from the port. But the coastal road was a real treat, the sun was shining, we had mountains on one side and the sea on the other and there was very little traffic. 15km later we raced to the last daylight ferry to island number 4 in total and 3 of that day, Pag. 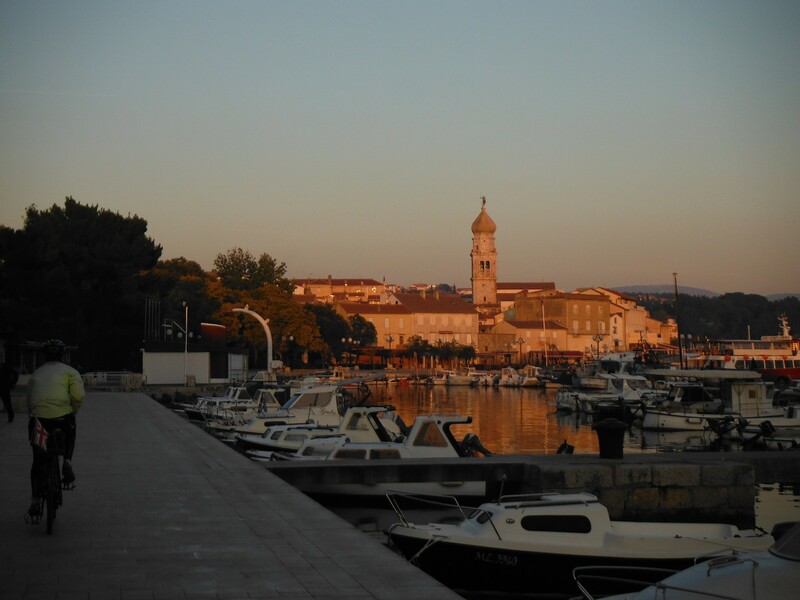 (Northern Croatian islands are limited to 3 or 4 letter, one-syllable words it seems). 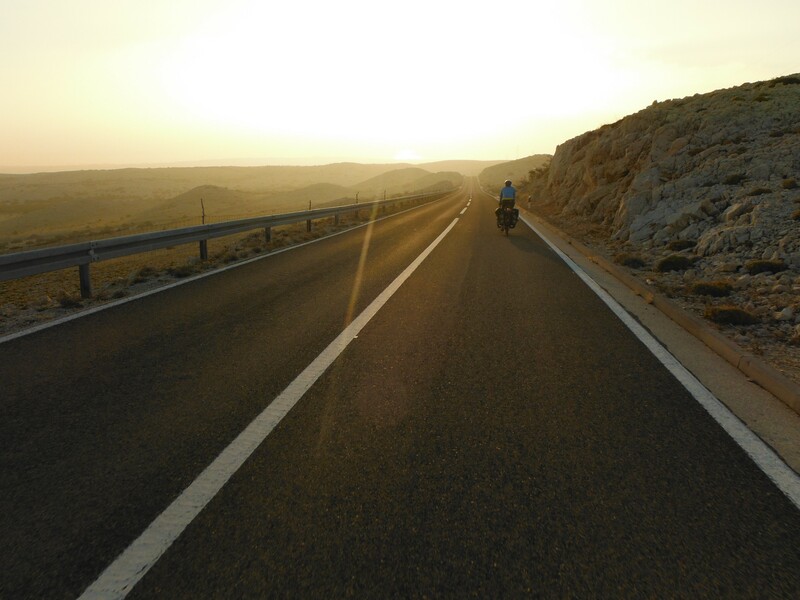 Pag continued the moonscape theme, and riding as the sun was setting through barren pale rock was really quite spectacular. There was no chance of pitching a tent here so once we reached the first town, Novalje, we started knocking on some of the many doors with ‘room’ signs to see what deal we could get. Yet there was either no answer, or they were not being rented out of season. Finally we found a lady who despite speaking to us in German, let us an apartment that was in the midst of renovation. Using skills learnt watching The Apprentice I negotiated the price down a few euros and this was lesson number one that although it looks like there is loads of accommodation, rocking up to a town to find a room isn’t that easy in November. 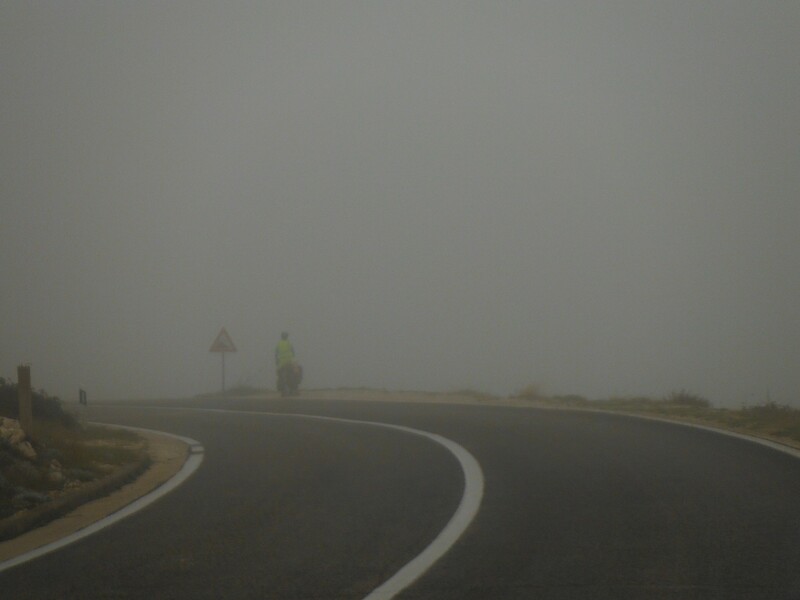 The cloud was back the following morning so we have no real idea what Pag looked like beyond Novalje as at times we could hardly see 100m ahead. 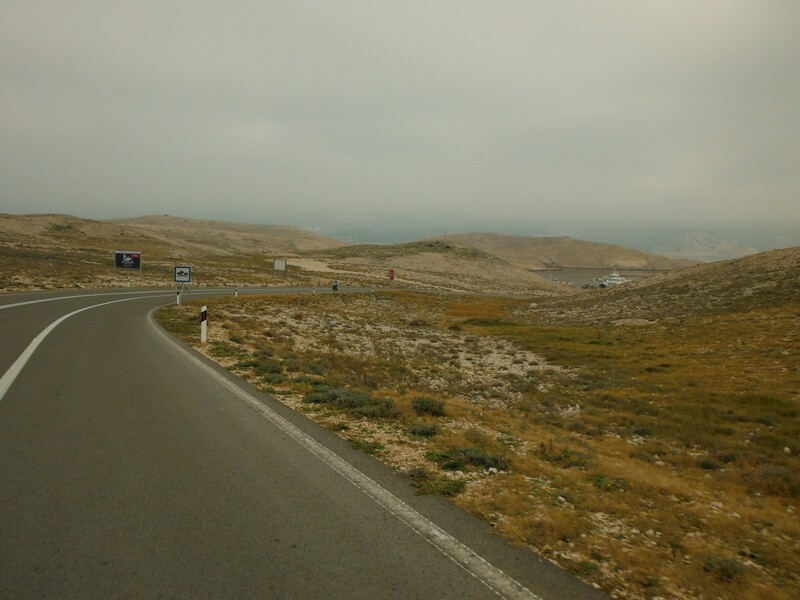 Pag Town is apparently an attractive small town that occupies a beautiful bay setting but to us it was just white cloud so after fuelling up with puddings (one of our current favourite calorific snacks, similar to a pot of cold custard) we rode on through the cloud. A bridge connects the southern end of Pag with the mainland and by this point the cloud had lifted, the sun came out and we went from wearing full waterproofs, reflective vests and thick gloves to shorts and t-shirts in a matter of minutes. 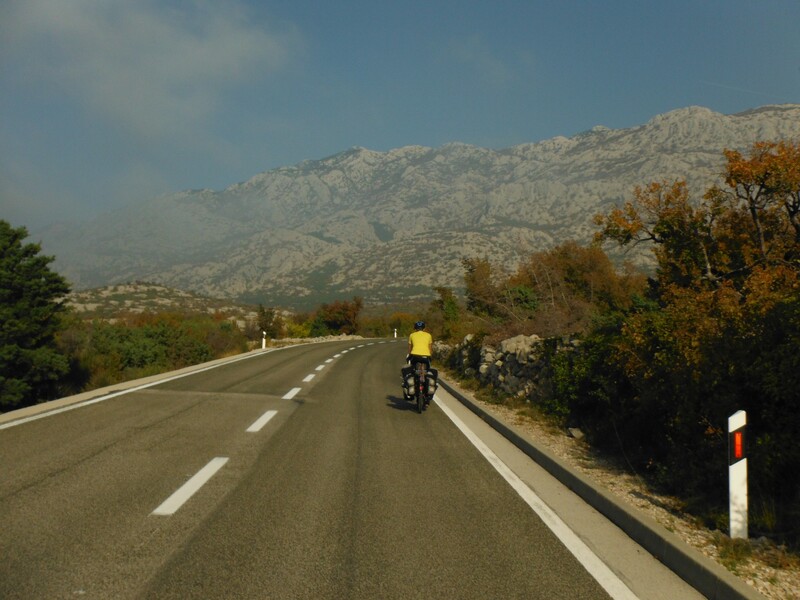 At this point we also saw other cyclists for the first time in Croatia – a bunch of guys in Lycra on road bikes who waved but did not offer us the excited encouragement of their Italian counterparts.